if you ows iPhone 7 or later, this article will be useful. Today, I want to tell you how to deal with charging your iPhone and listening to music at the same time. Do you want to listen to your favorite music while charging your iPhone? That used to be easy in old models with 3.5mm source for audio, new models are lacking of this handy feature. We could connect our iPhones to home stereo systems, car stereo, speakers, headphones and all the other audio devices with the jack connection. Nowadays, there is no any AUX port in iPhones, but the availability of listening to music was left to the Lightning port that usually was used for charging a smartphone.After well-known AUX port was removed from new iPhone models, Apple offers a special dongle connector (Lightning to 3.5mm) with their new phones (iPhone 7 and later including the newest X model). This dongle is some sort of adapter that can be plugged into the Lightning port. Then, you will be able to plug in an AUX cable. But plugging it in takes the Lightning port, so it's not free any more. 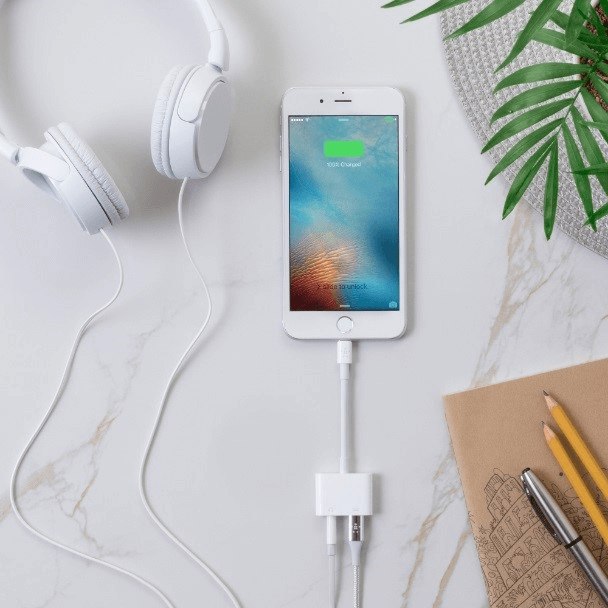 After you connect a dongle, you can't charge your iPhone, can you? Bluetooth and wireless interfaces are coming to our minds as the first variant of solving this problem. The second one is getting a third-party splitters that give you a chance to use both 3.5mm and Lightning ports from just one adapter. As for me, this way of coping with this task is the best for those users who often need to connect their iPhones to audio system. You'll have an opportunity of charging your smartphone while listening to your favorite music. It's comfortable. This will be a great solution, as many people often listen to music from their iPhones while charging it at home or in a car. There are tons of various models of such dongles, for example, a no name adapter made in China can cost you around $5 while Belkin's solution will cost nearly $40. Still, the quality will be fairly high. Search for such an adapter on Amazon. However, be ready to notice that cheap models often have poor feedback. Surely, you can take them at your own risk, however, personally I prefer to spend a couple of bucks more and get a really high quality well rated gadget. An alternative option is getting more of AUX 2 Lightning dongles for every AUX cable you utilize, but this solution is 'hot-swap' and won't fully cover all your needs. Especially if we talk about how to charge your iPhone and listen to music from it simultaneously. As I've already told earlier, Bluetooth is a built-in feature in any iPhone and some stereo systems at homes and in cars. You can also upgrade the systems that are not equipped with a Bluetooth receiver. However, such a solution can be more expensive than a $40 adapter. Bluetooth is a good way to keep your Lightning port free for charging while listening to music. Still, I can bet you have a lot of 3.5mm cables and devices that support that interface, so, I recommend you buying a splitter and continue using your device comfortably. That's the solution, my friends! If you know alternatives to the method I've described above, please share it in the comments. I think that it's a pity that people can't charge iPhones and listen to music simultaneously, but we can still beat that limitation.